This material culture-based text researches the history of a collection of damaged clothing (1900–50s) once worn by farming families in Normandy and Brittany. 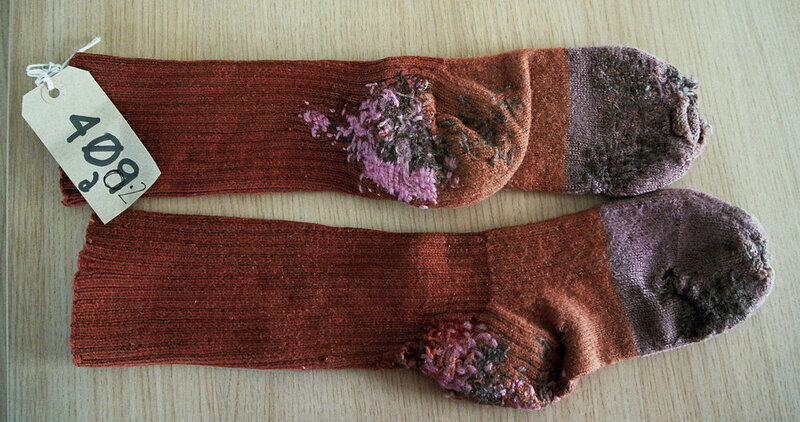 The clothing was excavated from a textile dump in an abandoned warehouse in Normandy in 2012. This research examines the six life cycle stages of this clothing from original use, to abandonment, resurrection, and upcycling onto the extreme edges of the vintage fashion world. This text then follows the growing use of ragged clothing as design inspiration for both costly couture garments and the cheapest mass high street designs over the last thirty years or more. Carefully destroyed but brand-new and sweet-smelling denim jeans and jackets are now admired by celebrities and young high street fashion consumers around the world as fashionable commodities — worn with little regard to the health dangers faced by workers dealing with sand blasting and bleaches. The research then examines the cultural and social forces behind this interest in destroyed textiles in the world of fashion. This text examines a collection of ragged and damaged clothing dating from around 1900 into the 1950s, excavated from a large textile dump found in a farm barn in Normandy. Abandoned, it seems, in the mid-1950s, the dump consisted of large, bound, and compressed bales piled on top of each other and left to rot as valueless in damp, rat-infested conditions for over sixty years. In about 2010 it was discovered, purchased, and “excavated” by an architectural heritage dealer from Sussex. This research, with its focus on women’s clothing, assesses the several lives of rag dump clothing from Normandy over a period of more than a hundred years as it has passed from one community of consumption to another. What has proved so fascinating in this object-based material culture research project has been to follow the unexpected life cycle of this clothing from birth to resurrection. No matter its condition, as Roger Silverstone has argued: “The life of an object … gains its meanings through the various social, economic, political, and cultural environments through which it passes and its passage can ... illuminate those environments in the way that [a] flare ... can illuminate the sky.”1. This research will show that these clothes moved through six life stages: firstly used for field, domestic, and farm work, secondly passing to small scale “chiffoniers” — rag dealers — nicknamed “biffins,” thirdly sold on to large scale dealers — “chiffoniers-en-gros” — who stored the ragged textiles in large warehouses, fourthly to abandonment when no longer required, fifthly resurrected, cleaned, and finally launched into today’s world of “poverty chic” fashion — the sixth and final destination. In commercial terms, today this collection lies on the extreme edge of the vast global recycling and vintage fashion industries, much studied by dress historians such as Alexandra Palmer, Hazel Clark, Lucy Norris, Margaret Maynard, Karen Tranberg Hanson, Tracey Diane Cassidy, and Hannah Roe Bennet.2 Finding the exact whereabouts of this dump, beyond the fact that it is in Normandy, has proved impossible due to professional competitive secrecy today amongst vintage clothing dealers. The specific interest within these clothes lies in their survival as rare examples of worn-out rural working clothing from Normandy, c. 1900–55. Most of the garments are meticulously and heavily patched, worn, and frayed to the point where, finally, they were no longer serviceable even in the fields. Some, those hauled out from the centre of the rag dump pile, were in better condition than the ones on the edges of the dump, whose condition was worsened by chewing and eating by rats, bird droppings, the bleeding of colours, and the growth of mould as rain penetrated the storage barn (see fig. 1). Nonetheless, they offer us today a picture both of the reality of the working clothes worn in the Normandy countryside and of the region’s rag dealing trade in the first half of the twentieth century. Rats’ teeth marks on the hem of a short rag dump tablier, Normandy, c. 1900–30, University of Brighton Dress History Teaching Collection, no. 364. 1-12. Professor Lou Taylor, photograph. Men’s, women’s, and children’s clothes survive in these three collections. 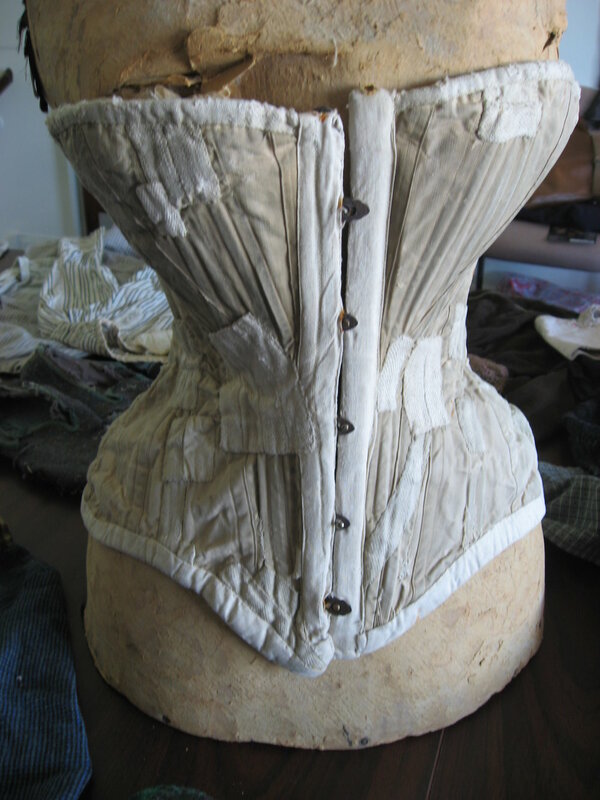 The women’s clothing includes underwear, such as a patched S-bend corset of about 1905–10 in the Davidson collection (see fig. 2), and other damaged, pink, elasticized fabric corsets from the 1930s, women’s open-legged drawers in sturdy white cotton woven with narrow black stripes and patched with various other cotton fabrics, c. 1900–10, and patched black silk stockings. Corset, in cotton and boning, c. 1905–10, badly damaged, Lois Davidson collection, with thanks. Professor Lou Taylor, photograph. Short patched woman’s outdoor wear tablier, Normandy, c. 1900–30, University of Brighton Dress History Teaching Collection, no. 408.05. Professor Lou Taylor, photograph. Patched day dress, Normandy, c. 1935–45, University of Brighton Dress History Teaching Collection, no. 408.08. Professor Lou Taylor, photograph. Socks, hand-knitted in brown wool and darned in six different shades of coloured woollen threads, University of Brighton Dress History Teaching Collection, no. 408.02. Professor Lou Taylor, photograph. The sturdy fabric of all the women’s outer garments is dark — either dark blue, black, or grey rough cotton and linen or wool and cotton mix. Some examples are woven with small repeat jacquard patterns in white. Some are roller-printed in white with tiny dots and geometric designs or small flowers — classic French fabric for elderly working women. Men’s clothes are also in indigo blue or dark grey but in heavier cotton drill or denim. Above all, in every garment, it is the endlessly patient womanly patching, on top of layers of existing patches, and the patient over-darning that stays in the memory (see fig. 6). This hand work indicates with powerful force both the financial need for this painstaking patching and the frugality of the owners — or both. In some examples, it is barely possible to see the base material at all. 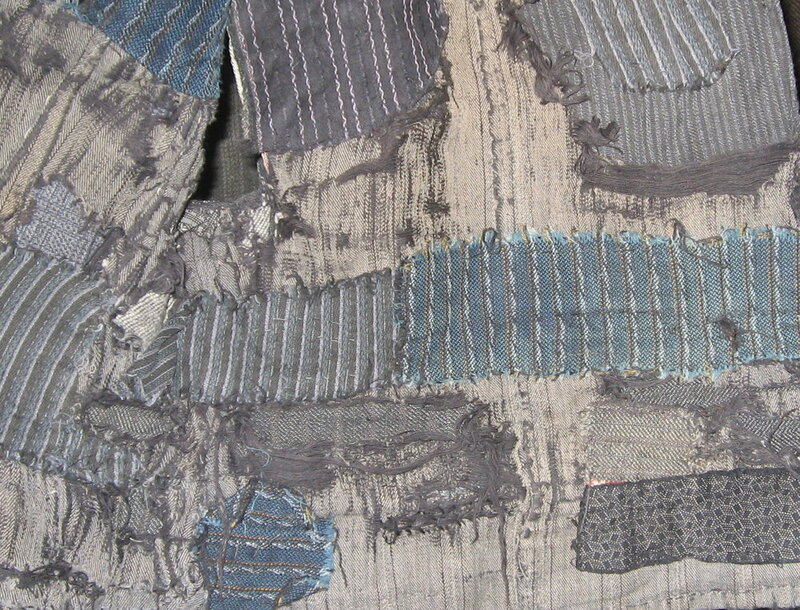 Detail of patches on long waistcoat for a woman, c. 1910–30, Lois Davidson Collection, with thanks. Professor Lou Taylor, photograph. The starting point for research has been probing the life cycle of these clothes. Fred Davies believes that “the universe of meaning attaching to clothes, cosmetics, hairstyle and jewellery, right down to the very shape and bearing of the body itself, is highly differentiated in terms of taste, social identity and person’s access to the symbolic wares of society.” He adds significantly that fashion and dress are “the irrepressible out comings of localities, regionalisms and particular-isms of every sort.”7 This concept of highly specific communities of dress is exactly applicable to my story here. Post card, Bonnet Rond, Bayeux, about 1905–10, published by C.P.A. Bernard, Caen, Normandy. Professor Lou Taylor, photograph, author’s collection. 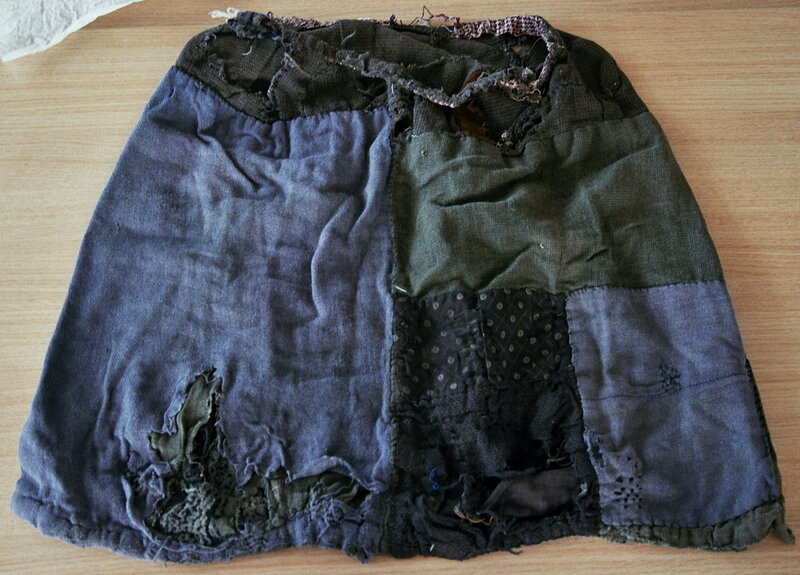 Using Prown’s material culture method of deduction and speculation,8 coupled with Kopytoff’s notion that objects have biographies and life cycles,9 research soon clarified that these garments were worn firstly as hard-wearing everyday clothes, either homemade or bought in markets and city stores, and then, once shabby, were used for rougher outdoor work in Normandy and parts of Brittany. There are no signs of “Sunday best” church and festival dress here whatsoever — no velvet bodices, embroidery, or fine lace coifs, such as the bonnet rond example from Bayeux of about 1910 (see fig. 7). There is nothing but signs of hard work and rural frugality, and hours of patient sewing and patching. Mrs. Henrey, a Londoner, who, in the 1930s, bought a farm house in rural Normandy just inland from Cabourg, provides confirmation of this. She writes that in 1938, on her neighbour's farm, Louise, the short-sighted, youngest daughter, “did not work out of doors, but was the lady of the needle, making her sisters’ dresses and her brothers’ shirts and overalls, mending stockings and socks, sewing in the buttons.”10 That was her full-time occupation.